The British comedy legend reflects on his career and discusses his latest stage show, Why There Is No Hope, in which he examines what he sees as the failings of the world's leaders. 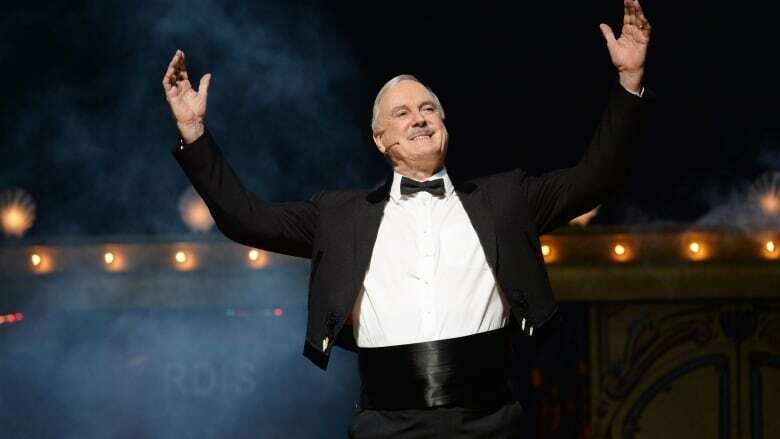 Over the past 50 years, legendary actor, comedian, screenwriter and producer John Cleese has been garnering laughs on stage and on screen in classics like Monty Python and the Holy Grail, Fawlty Towers and countless other favourites. In his latest stage show, Why There Is No Hope, he's taking aim at what he sees are the failings of the world's leaders — and he says it all starts with not caring about being liked. "I was much more cautious when I was younger because I made the mistake of wanting everyone to like me," Cleese told q guest host Ali Hassan. "So I do speak out much more strongly than I used to. I want the people in charge to be good, decent people. The great problem at the moment is that an enormous number of the world's leaders are total assholes." In his conversation with Hassan, Cleese looks back on his career, his comedic influences and what keeps him laughing today. You can catch Cleese live this May when he brings his Why There Is No Hope tour to Canada. He'll be in Halifax on May 5 at the Scotiabank Centre, Toronto on May 13 at Roy Thomson Hall and Vancouver on May 25 at the Queen Elizabeth Theatre, with more dates in Saint John, Charlottetown, St. John's, Kitchener, London, Regina, Saskatoon, Edmonton, Calgary and Victoria. Click 'listen' near the top of this page to hear the full interview. Do fan campaigns to save TV shows actually work?